The 2018 Viet Nam-Laos Trade Fair businesses are taking part in Vientiane to promote the bilateral friendship, cooperation, and development. 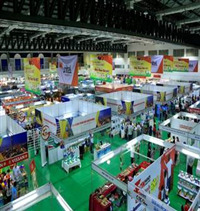 This year’s trade fair featuresover 200 pavilions, including 120 booths set up by Vietnamese firms,introducing their outstanding products, ranging from garment and textiles, footwear, agro-fishery-forestry products, handicrafts, processed food, industrial machines, construction material, fertilizers, and chemicals. Addressing the opening ceremony,Senior Lieutenant General Tran Don,DefenceDeputy Minister, said this is the fourth time the Vietnamese Ministry of NationalDefenceand Ministry of Industry and Trade have coordinated with the Lao counterparts to host the event. He described the fair as an important political, economic and social event to promote friendship and collaboration between the two peoples. It also creates a good chance for businesses and particularly military-run firms to seek partners and expand relations in Laos and other members from the Association of Southeast Asian Nations (ASEAN), he added. Currently, Laos is one of 64 countries and territories where Vietnamese businesses are investing in, while Viet Nam is the third-largest investor in Laos. The Viet Nam – Laos Trade Fair is expected to contribute to boosting the economic and trade relations between the two nations./.